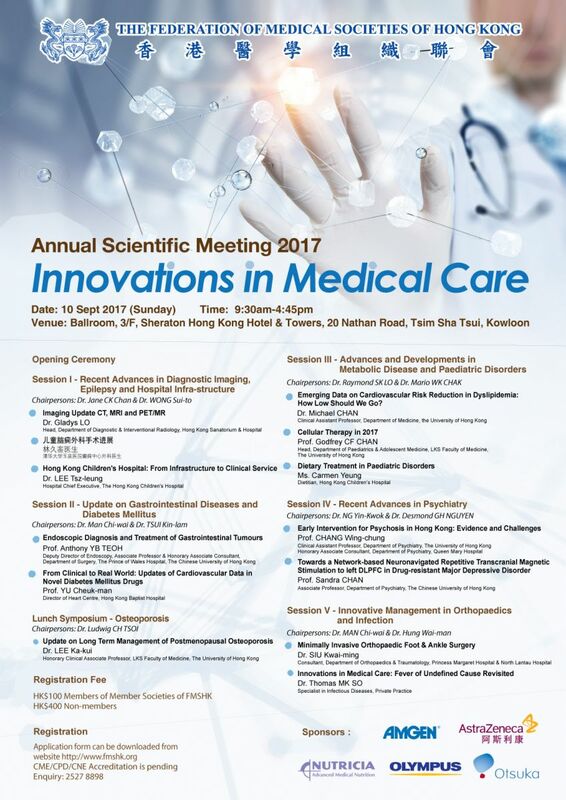 On 10 September 2017, the Federation of Medical Societies of Hong Kong successfully held the Annual Scientific Meeting 2017 at the Sheraton Hotel and Towers, with the theme of “Innovations in Medical Care”. A total of 13 medical talks were delivered by a panel of distinguished speakers. They shared with us the latest knowledge and developments for Diagnostic Imaging, Epilepsy, Hospital Infra-structure, Gastrointestinal Disease, Diabetes Mellitus, Osteoporosis, Metabolic Disease, Paediatric Disorders, Psychiatry and Orthopaedics. FMSHK was much privileged to have the Officiating Guest, Prof the Hon Sophia CHAN, JP, Secretary for Food and Health; and the Honourable Guests, Prof Gilberto LEUNG, Vice-President (Education and Examinations) of The Hong Kong Academy of Medicine, Dr the Hon LEONGChe-hung GBM, GBS, OBE, JP, Prof the Hon Joseph LEEKok-long, PhD, RN, SBS, JP, Legislative Councillor (Health Services), Dr LEETsz-leung, The Hospital Chief Executive of the Hong Kong Children’s Hospital, Dr Mario CHAK, the President of the Federation, Dr Raymond LO, the Immediate Past President, Dr MANChi-wai and Dr Jane CHAN, the Vice-Presidents to officiate the opening ceremony. Prof CHAN and the Honourable Guests showed us the 10 important steps to achieve innovation momentum, namely, Clinical Challenges, Motivation to Change, Updated Knowledge, Big Data, TechnologyDevelopment, Overseas Collaboration, Patient Engagement, Small Scale Pilot Project, Dedicated Focus and Effort and Innovation Momentum. .We would like to take this opportunity to express our sincere gratitude to our Officiating Guest, Honourable Guests, Co-chairmen, Chairpersons and Speakers for their contributions that made the event a great success. Our gratitude also extends to various sponsors for their generous support. We look forward to seeing you in our Annual Scientific Meeting in 2018!